I’m exhausted. 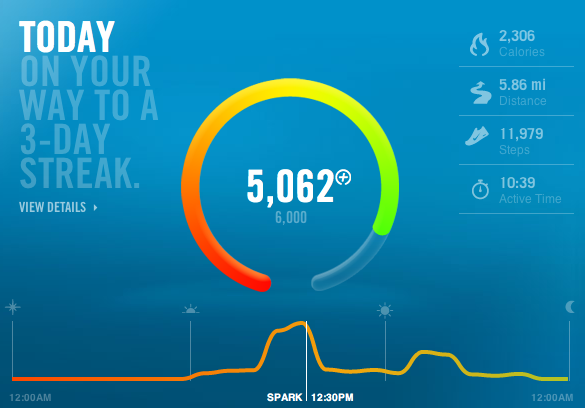 6,000 Nike Fuel points is not easy to do. After swimming, Noon Hoops, hitting the weight room after work, and then the treadmill, I’m only at 4771 right now. I’ve been wearing the Nike Fuel band for a few days, I hit 6,000 fuel points on Monday. I posted that if I get 6,000 points every day, Monday-Friday, I will reward myself by going to see the new movie ‘Jack Reacher’ this weekend. Everyone up to speed? GOOD. I’ll have to do like chores or something get to 5000 on the band (+ the swim and the weightlifting that Nike Fuel doesn’t count = 6000). Not looking forward to that. Also, pretty sure I’m killing my legs. I’m going to write this entire post and leave it open, go do some chores, then post the stats before bed. I really want to see that movie this weekend! At the gym, I was able to finish off the squatting with 200 and then 205, five times each. I read in Men’s Journal that healthy squats go down to almost parallel, so that’s what I’ve tried to do consistently. I’m still on track to hit 300 by the end of this thing, so that’s fun! I still haven’t felt any pain in my knees lately, so that’s even MORE FUN NOT SAD. Today’s RAOK was to sign a petition online. I never, EVER sign online petitions. They make you register first and blah blah blah I don’t need people keeping records on me! 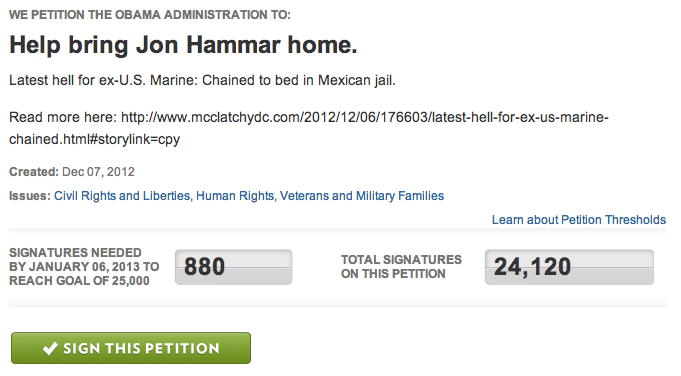 I took the time to register, sign in, and sign the petition that is trying to get the white house to intervene in the detention of a young ex marine that went into Mexico with a gun that had a barrel that was like 2″ too short, so he is in Mexican jail. Today I’m thankful for stand-up comedy. I love seeing comics perform. 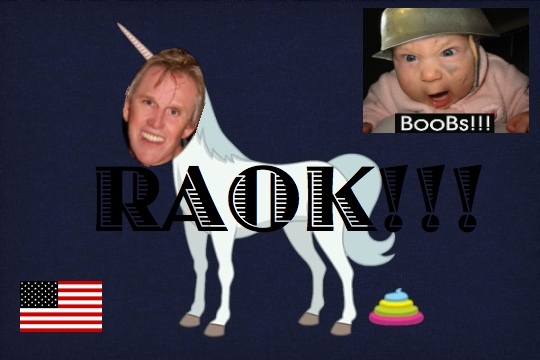 I’m going to make it a point to go see one stand-up comedian/sketch show/improv group a month in 2013. Now someone remind me that I said that on January first, would you? Thanks, sugartits. Remember well Mel Gibson said that? Oh, alcohol, you naughty vixen. I’ve realized that swearing is a big part of my life. That’s a weird sentence. Still, it’s true. I swear so often that I don’t even know that I’m doing it, but when I’m in public around or around people I don’t know that well, I don’t really swear at all. My subconscious knows when to pump the breaks on the out of control swears. Way to go, unconscious mind *sarcasm font needed*…how bout you do something useful. I don’t care if I swear in front of pre-schoolers, just turn off the hunger pangs after 6pm ok? Laundry and picking up around the house = fuel points. DONE. I will only eat things that myself or my friends/family have prepared. FAIL! I ATE BDUBS ONCE! I won’t say a swear word, not one. Day 1: approx 12, Day 2: approx 5, Day 3: approx 2, Day 4: approx 2, Day 5: approx 6, Day 6: 2 exactly Day 7: approx 4, Day 8: I think zero. Day 9: back up to like 4. Day 10 approx 5 or 6. Day 11 approx 4. Day 12: 3 exactly Day 13: 2? maybe 3? Day 14: I think zero!? Day 15: A BIG ONE and like 2 more. Day 16: a couple here and there.